My apologies for the delay in getting todays post up. Today is another Wonderful Wednesday here at CookingWithCricut.com. It’s another new, fun challenge! Today’s theme and challenge is in honor of June being national dairy month. 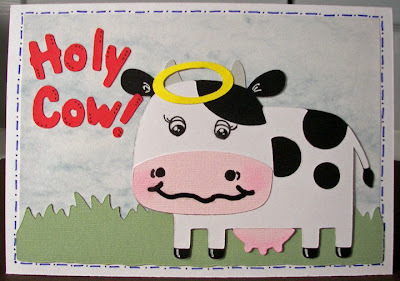 So while it’s the last day of June we still want to give a shout out to all those loveable little cows. Create a project with a Cow on it or in it OR a project with black and white and just a tid bit of a third color if you can’t use a cow! How fun is that? So here is what the wonderful Design Chefs of CWC cooked up for you! Stacey used the Nursery Rhymes and George & Basic Shapes Cartridge. Jenny used the Pop Up Neighborhood Cartridge. Roberta used the Imagine More, Imagine More Cards and Mini Monograms. Jean used the Don Juan Cartridge. 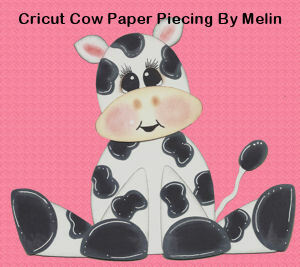 Jen used the Create A Critter, Paper Doll Dress up and Pooh Font Cartridges. Madison used the Create A Critter Cartridge. This little cow is a "sneak peak" of a Cricut project I am working on for this weekend! He is made with my Cricut Expression and One Cartridge :-) Be sure to stop back by this weekend to check out the details! Now it’s your turn! Let’s see your adorable and “MOO-valous” creations! Project must be a new project for this challenge. Project must include a cow or be black and white with only a small amount of a third color. Project needs to include a Cricut cut. Must link your project through INLINKZ below not just your blog. Your project post must include a link back to CookingWithCricut.com. As always, thank you so much for joining us! Thanks so much for the wonderful DT inspiration! You ladies did an amazin job! All the entries GOT MILK (and I mean that in a good way). Submitted my entry this morn Sat 7/2. Just posted my entry. Hopefully you can view my blog. Thanks! Love everyone's cows they are adorable!!!!! I of course just did black and white leave it to me to be different LOL This was another great challenge Thanks for the all the fun and inspiration.